Top 4 Games like Matchington Mansion Article - Free Casual Games! Rate this Article Matchington Mansion is one of the best match-3 puzzle games out there that offer much more than a simple match-3 gameplay - You get to have fun decorating your virtual home as well. This article discusses four games that have the same level of awesomeness to offer. Machington Mansion, the hottest match-3 game in town, is truly a work of brilliance. Its entertaining game play brings a unique home building feature where players get to decorate and design their in-game rooms with the most stylish furniture. This perfect combination is what makes the game so addicting and if you haven’t tried it yet, you are surely missing out. However, if you have finished playing this masterpiece already, this article is perfect for you as it discusses four cool games that offer a similar entertaining game play experience. First on the list is the epic puzzle game called Homescapes. This package of entertainment offers a huge variety of unique match-3 puzzles for you to solve but the fun doesn’t end just here. You also get to restore a family mansion to its former glory in this epic game. Homescapes offers beautiful gardens for you to take care of, statues to build, decorations to introduce and much more. You are guaranteed to never get bored of this game. Gardenscapes: New Acres is another such masterpiece that offers both match-3 puzzles and a building experience involving a beautiful garden for you to take care of. You get to introduce beautiful park benches, flower beds, styled path ways, fences, statues, fountains and many more amazing decoration items in your garden as you solve the match-3 puzzles to fund your renovations. The game has a huge variety of challenging puzzles to offer that will keep you addicted to the game till the end. 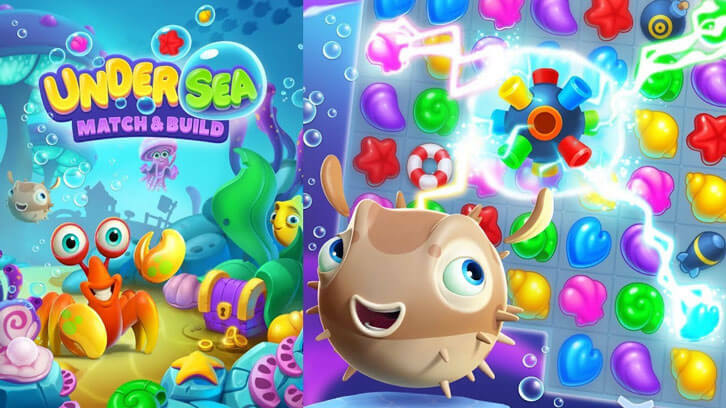 A mention of Undersea: Match & Build is mandatory in this article as it offers a really exciting combination of match-3 puzzles and building variety to the players. You get to play as Alfred, the crab, and rebuild its home after a cruel storm. The game brings stunning visuals to the screens and unique underwater sea objects for you to play around with. Coral reefs, gem stones, sea plants, the game has got them all. Last but not the least is the game Family Zoo: The Story. As the name suggests, the theme of the game is a family zoo that needs some renovation to attract customers and do some serious business. You get to solve match-3 puzzles and earn resources that can help you introduce the cutest and the most exotic zoo animals and decorations to your family zoo in the game. Playing a simple match-3 puzzle game can eventually get boring. This is why puzzle games with a building aspect are always quite entertaining. You get to bring out the interior decorator residing within you and enjoy an epic variety of decorations to work with. If you are a Matchington Mansion fan, you should definitely give these games a try.